The night is over but the morning hasn’t arrived. I can tell because the roosters are crowing. If it was 2 a.m. or even 3, there’d be no sound. At that hour, the cars have stopped whizzing down the nearby arterial, and the wild chickens haven’t started up. At that hour, it’s as if even the second hand stops its advance. How do I know this? Because I often wake up. I read that my segmented sleep was once normal, when, before electricity, people went to bed not long after dark and got up during the night to think, write or even visit friends. I used to argue with myself about whatever was on my mind, harrangued myself “go the f*** to sleep.” Then I played yogi and tried to think relaxing thoughts — which may be part of the problem, since a yogi would know you can’t “do” relaxation. But now I just listen. First I listen for the cars and chickens, so that I know what time it is. Then I listen to my husband breathe. A few weeks ago, he sounded like a slide whistle, starting on a higher pitch and sliding a few notes lower. Every so often, he changed keys. It may sound annoying but it wasn’t. I was smiling, next to him, almost giggling. I picked up my iphone, recorded his little symphony and thought about posting it on my social media. I thought the better of that idea — his revenge might be too sweet since I’m the snorer — but in the morning I played it back for him and we laughed about it. Most nights, my husband’s breathing is heavy and regular. Listening to him breathe, I stop worrying about sleep, about the approaching day, about all the problems I can’t fix. His breath surrounds me. Turn off, brain, and let me go the f* to sleep! Just when I feel overwhelmed by my Dad’s declining health, it seems that the sleep gods conspire against me. 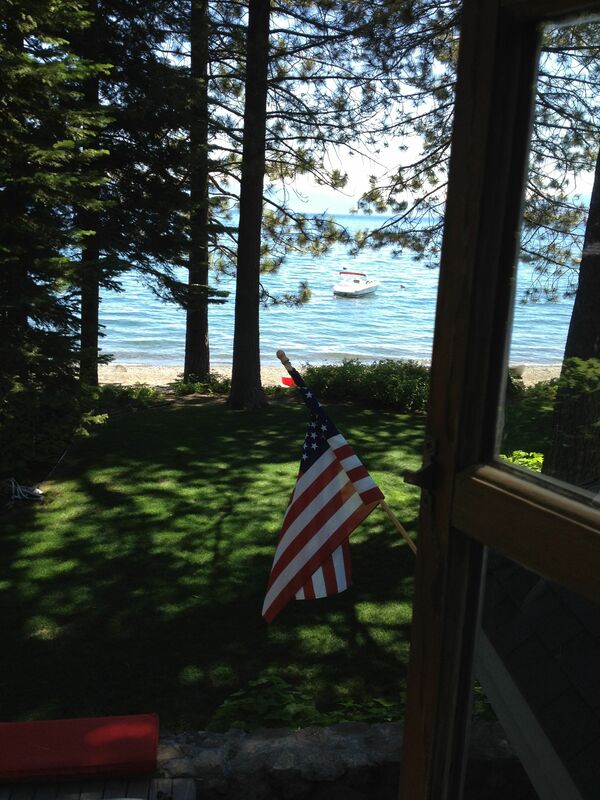 My anxiety – and accompanying sense of hyper-vigilance – built to a pitch over the weekend, even while my husband and I attempted to relax in Northern California’s playtime paradise of Lake Tahoe. Over the past month, the medication that had been working so well to control the symptoms of Dad’s long-term congestive heart failure sputtered and stalled in its effectiveness. His weight dropped from 204 lbs. to 188.5 over three weeks, and then, when we cut back the dosage, spiked back up to 198 in less than a week. Him: Do I really need a carryon? I was just gonna keep it simple with a rollaboard. Me: No. It has to be one of the small black ones. Sounds like you don’t have a choice unless you have a duffel that qualifies as a carry on. Southwest is pretty good about getting bags there so you’ll probably be fine. Don’t check your computer – keep it with you. Me (yet again): Can I go back to sleep now? Me: OK but keep your computer with you. Put your name and home address on a piece of paper inside the checked bag. Make sure it has a luggage tag too or put a paper one on it at the airport. Travel safely. Me: OK but if they make u check it remember to keep your passport with you, preferably in something by your feet. Passports can get stolen out of backpacks in bins. Students get targeted by thieves. Me (finally): OK goodnight. I love you. Have fun. You can guess how the night went after that. I didn’t fall gently back into slumber. On Monday, I made a record 20 phone calls to my father’s doctor, to friends and family who visited my father at his assisted living apartment, and to family to report in. At the time, Todd and I were attempting to complete a 7 mile hike. That night, I was awake from 3 a.m. to 5:45 a.m. I’d drift into sleep and pop right back out of it. Five question marks is about right. “Grief is a journey, I’m told,” my friend texted last night. Yes, it is. But I am fortunate to not be on the trail alone.